The hiring of Guber and Peters by Sony to run Columbia was conflicted by a previous contract the producers had signed at Warner Bros. Warner Communications's chairman, Steve Ross, threatened Sony with a lawsuit for breach of contract. 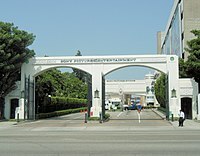 The lawsuit would be subsequently dropped when Sony sold half-interest in Columbia House and cable distribution rights to Columbia's feature films, TV movies, and miniseries to Warner Bros. That same agreement also saw Columbia sell its 35% interest in the Burbank Studios and acquired Lorimar Studios, previously the MGM lot, from Warner Bros.
^ a b c "Supplemental Information for the Consolidated Financial Results for the Fourth Quarter Ended March 31, 2018" (PDF). 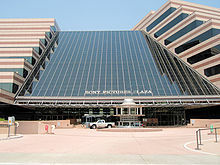 Tokyo, Japan: Sony Corporation. 2018-04-27. p. 10. Retrieved 2018-05-06. ^ David E. Sanger, Special To The New York Times (1989-09-28). "Sony Has High Hopes For Columbia Pictures". The New York Times. ISSN 0362-4331. Retrieved 2017-07-26. ^ "Sony Pictures Entertainment Brings Marvel Studios Into The Amazing World Of Spider-Man" (Press release). Marvel. Retrieved 2017-02-11. ^ "Sony tries to upload movie trailer to YouTube, posts entire movie instead". Ars Technica. Retrieved 2018-07-28. ^ "Sony Hack: Amy Pascal and Scott Rudin Joked About Obama's Race in Leaked Emails". The Hollywood Reporter. 2014-12-10. Retrieved 2017-10-15. ^ Saba Hamedy (16 April 2015). "Sony Pictures condemns WikiLeaks' release of hacked material". Los Angeles Times. Retrieved 30 November 2017. ^ Eriq Gardner (17 April 2015). "Sony Hack: WikiLeaks Publishes More Than 30,000 Documents". Yahoo! Movies. Retrieved 30 November 2017. ^ "WikiLeaks - Sony Archives". 16 April 2015. Retrieved 30 November 2017. ^ Desta, Yohana. "Actually, Seth Rogen Doesn't Think North Korea Was Behind the Sony Hack". HWD. Retrieved 2018-07-28.